This is a free weekend for most of the competing clubs and the Woodlands squad enter it on the back of a 59-12 triumph at South Leicester. That left them third in the table and just three points behind Hull Ionians, who still occupy the only automatic promotion place but have lost four of their last seven games. With five to play, the Humbersiders have the least demanding schedule among the title rivals while Fylde are yet to face four of the top six. Huddersfield play their game in hand at Tynedale tomorrow, when victory could leave the top four separated by just six points. 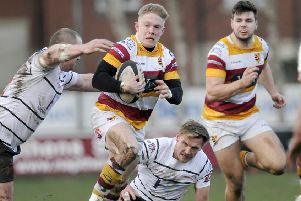 It could hardly be tighter and Spragg is relishing the decisive battles ahead, starting with Fylde’s penultimate home game against second-placed Chester a week tomorrow. He told The Gazette: “Yes, we have as good a chance as anyone. Apart from Hull, everyone plays everyone else in their final five games and it’s all about who is the most consistent. 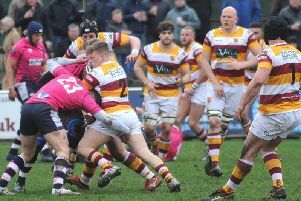 With no fresh injuries from the South Leicester game, Fylde hope to have Ralph Dowds, Elliot Horner and Adam Joyner back in contention for the Chester showdown, though it will be difficult to break into the side which demolished South Leicester. Spragg added: “We definitely got better as the game went on and some of our attacking play was really good. Tom Carleton’s switch to the wing from full-back didn’t prevent him from adding a hat-trick to his soaring try tally and fellow winger Henry Hadfield also earned his coach’s praise. “Tom Grimes was unavailable, and with Lex Botha and James Bailey injured, we had to reshuffle in the backs,” explained Spragg. “Tom is equally effective on the wing and we know Connor Wilkinson can play full-back. Back-rower Dave Fairbrother is due to undergo shoulder surgery today. It is hoped the Fylde talisman, who last played in November, will be raring to go for the start of next season.